Now you can bring Whimsy the Cat with you wherever you go! 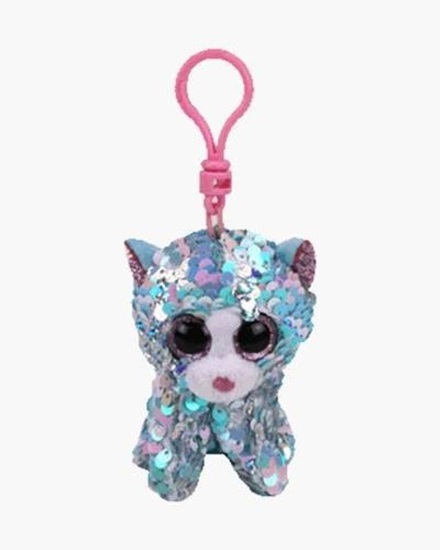 Ty Flippables Clips snap easily onto backpacks, suitcases and more, making them the perfect school or travel companionsDecked from ears to paws in sparkling sequins, this precious plush kitty cat is purr-fectly dazzling. And the darling large stuffed animal loves when you pet her and give her a new look. Just brush her reversible sequins up and down to change them from pink-and-blue to sparkly silver. Whimsy is approximatley 3.5 inches tall and is perfect for ages 3 and up.